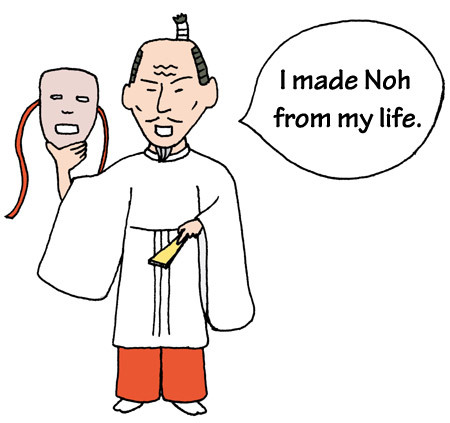 TRIVIA of Noh : Q104 : What new pieces were performed by Hideyoshi? | Home | Trivia | Q104 : What new pieces were performed by Hideyoshi? What new pieces were performed by Hideyoshi? It is well known that Toyotomi Hideyoshi loved Noh. It is said that the period he devoted himself to Noh was less than 10 years during the late part of his life. During this period, he had new Noh pieces created about his own achievements. The pieces are collectively called "Hōkōnō" (Noh plays for Prince Toyotomi). "Hōkōnō" is believed to have been created when Hideyoshi was 58. There were originally ten pieces in the collection, but only five have been handed down as written texts: "Yoshino-mōde," "Kōya-sankei," "Akechi-uchi," "Shibata," and "Hōjō" (although another piece, called "Kono-hana," was recently discovered). In the story "Yoshino-mōde", when Hideyoshi visits the temple in Mt. Yoshino, Zaō-gongen (the principal Buddhist image of the temple) appears in front of Hideyoshi and celebrates his reign. In the story "Kōya-sankei", when Hideyoshi visits the temple in Mt. Kōya on the second anniversary of his mother’ death, an apparition of her appears and praises the devoted son. "Akechi-uchi", "Shibata" and "Hōjō" each celebrate his victories in battle. Hideyoshi presented the pieces to the Emperor, and also performed almost all of them himself. Many of Japan’s rulers loved Noh – including Ashikaga Yoshimitsu (the third shogun of the Ashikaga dynasty) and Tokugawa Tsunayoshi (the fifth shogun of the Tokugawa dynasty) – but none except Hideyoshi had plays created about his own life and performed them himself.